inkXE – the product designer software from Riaxe Systems is the flagship product in the year 2012. It is announcing its participation in the ISS Expo and Conference 2018. We will be at Long Beach Convention Center from 19th – 21st of January 2018. InkXE Web to Print Solutions is participating to showcase its groundbreaking innovations. It will serve as the most flexible and reliable web-to-print solution for print businesses. During the ISS Expo 2018, inkXE will highlight its innovative solutions to help businesses who sell custom apparel, sportswear, and personalized promotional products. The company will also showcase the extensive features and how it facilitates both and print shops and their customers. ISS visitors will have the opportunity to learn more from our business team and discuss on utilities & the future of inkXE web-to-print solution. The company will also introduce visitors to its exclusive features & functionalities of its intuitive decorating software. What did our co-founders say? ISS show brings together personnel from decorated apparel business including buyers, suppliers, manufacturers in graphic designing, embroidery, screen printing etc. The convention hall will have 300+ exhibitors showcasing a range of equipment and software. Whereas, the software will range from a product designer tool to screen printing equipment. You will also see DTG printing, neon inks, sublimation printing equipment etc. You will find the latest t-shirt designs, colors, sweatshirt designs, baby apparel etc. 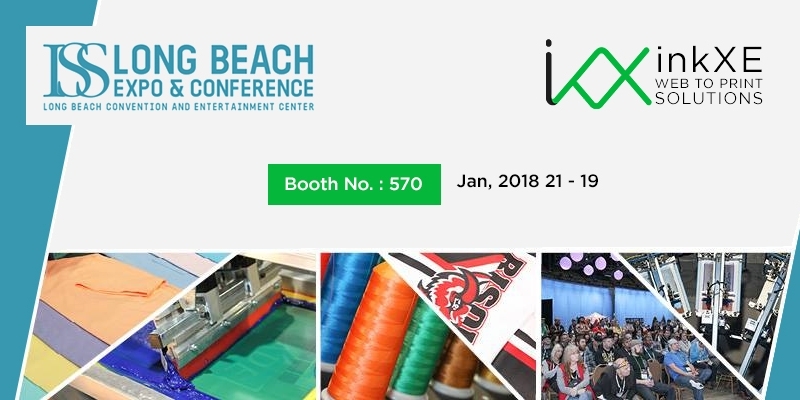 Attend ISS Long Beach to experience all facets of the decorated apparel industry. inkXE Web to Print Solutions is helping print shops and garment decorators to sell customized products and run a more efficient business It’s a part of a decade-old company and trusted by 500+ delighted stores across the globe for its advanced customization features & powerful admin system. It’s managed and maintained by a team of 50+ professionals, while continuously innovating with insights from business requirements to build a stronger business. It is not just a product customization tool but also business software. It will help print shop to grow their business, keep customers engaged and get more sales.